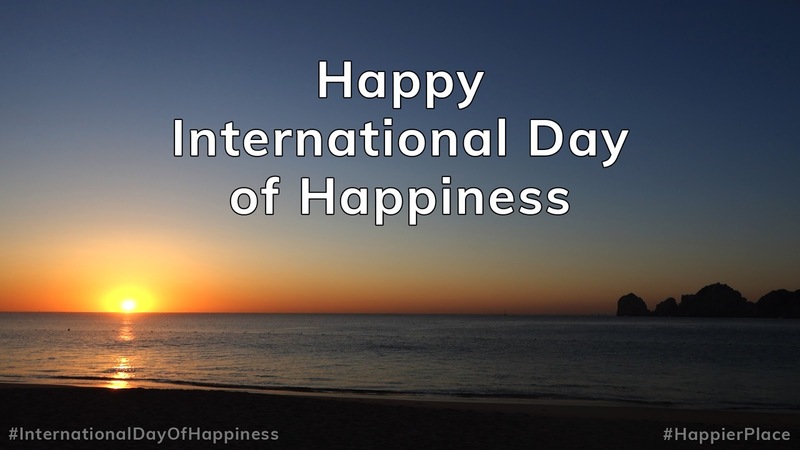 Today (March 20th) is the International Day of Happiness, and I wish all of you an especially happy day! Since 2013, the United Nations has recognized March 20th as the International Day of Happiness (also known as Happiness Day) to draw attention to the importance of happiness in the lives of people around the world. Of course, this is right up my alley. If you read my recent post "Happier Place - The What, Why and How," then you know I launched the website Happier Place to help inspire people to be happier. So it's with great pleasure and honor that I tell you: I was invited to be one of the co-leads of the Google #InternationalDayOfHappiness 2018 initiative!!! The main idea is to share, inspire, discover and celebrate happiness together by creating posts on Google+ and tagging them #InternationalDayOfHappiness. It would be wonderful if you'd join us on Google+ today (and really on any day) to share your happiness images and words - and use the hashtag #InternationalDayOfHappiness and any (or all - if fitting) of the special hashtags listed above. Of course, you're also invited to just click on any of the collections or the hashtags above (which will take you directly to the hashtag search results on Google+) to browse what others are sharing on this Happiness Day 2018. But most importantly, I hope that today you will do at least one thing to make yourself happier and one thing to make someone else happier. How to Get Happier in 3 Simple Steps: Take a Break. Go Outside. Have Fun.